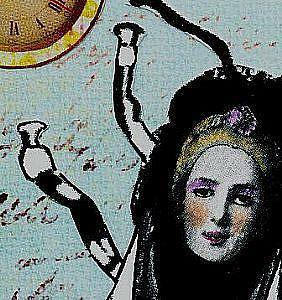 Once again we find ourselves at the end of one calendar year and about to start on a new one. As time runs down on 2017, all of us here at EBSQ hope that all of you have a safe and happy New Year's Eve and a wonderful 2018. 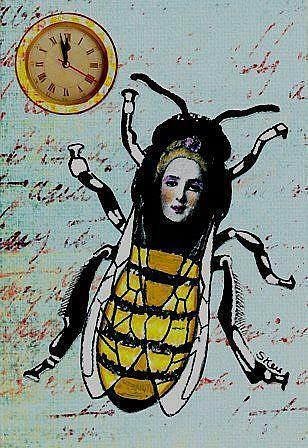 "Bee the Time Keeper" Another in my "Steampunk, Myths and Legends" series. Wonderful sea blues, golds and black. I love how the clock turned out looking 3-D. Some of it is hand colored and hand painted, embellished paper cut outs on a beautiful blue paper background. All of this artwork is pieced and collaged onto Bristol paper (like cardstock) so it's nice and sturdy. This is an OSWOA: All OSWOA are 4" x 6" (portrait or landscape)(about the size of a standard photo album page). If it is any other size it is NOT considered an OSWOA. This size is very collectible and looks great in a standard mat and frame. See this and all my items for sale on Ebay.